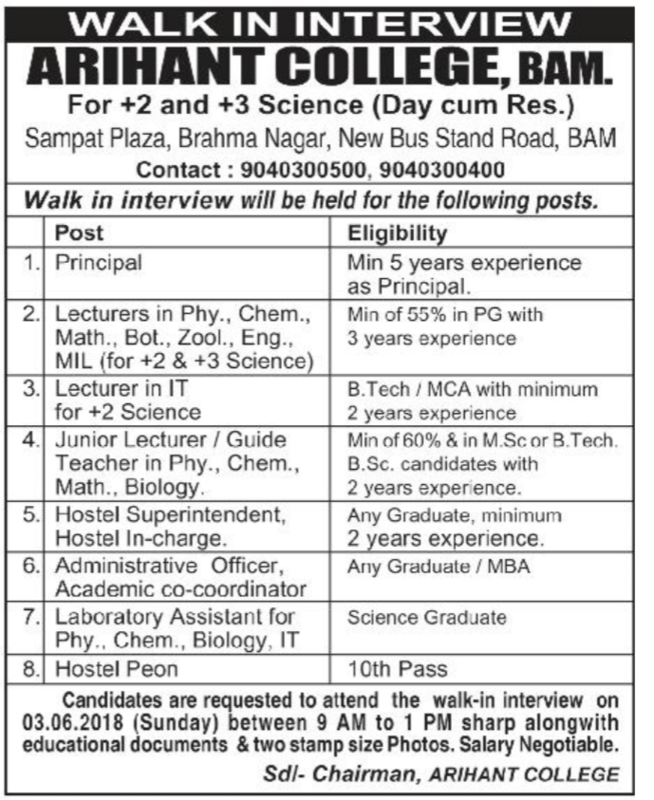 Arihant Junior College, Berhampur has advertised in THE Samaja newspaper for recruitment of Principal,Lecturer,Non Teaching Faculty jobs vacancies. Interested and eligible job aspirants are requested to attend interview on 03.06.2018.Check out further more details below. About College: Arihant Junior College is an initiative from Gitanjali Education & Charitable Trust towards the Higher Secondary Education in +2 Science & Commerce in Berhampur as well as in South Odisha. 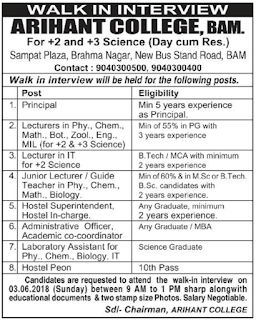 Arihant Junior college is founded by Mr. B.P. Bhatta, an educationist as well as a Mathematics teacher who has been providing best results in South Odisha since 2001, in +2 science, Engineering & Medical entrance exams through his coaching institute & college. 1.Minimum 5 years of experience as Principal 2.Minimum of 55% in PG with 3 years of experience as lecturer. 4. Min of 60% of in M.Sc or B.Tech B.Sc candidates with 2 years of experience. 5.any graduate with minimum 2 yrs experience. How to apply: Interested candidates are requested to attend the walk in interview on 03.06.2018, between 9am to 1pm sharp along with educational documents & 2 stamp size photo.